We hear this all the time so we really want to show you what it means to have a muscle strain. in. I just worked through a neck strain in the last month. Often patients are confused as to why it happened to them, the severity of it, and the timeline for recovery. My goal in this short article is to clear up the confusion and give you a concise understanding of muscular strain. occur. This cycle is not limited to any particular activity, but anything you do repetitively. decreased circulation and swelling and hypoxia (lack of oxygen) to the area. Due to this hypoxic state (lack of oxygen to an area), the formation of adhesions, sensitive tissue and scar tissue occurs to the area, which decreases the function of the local structures. 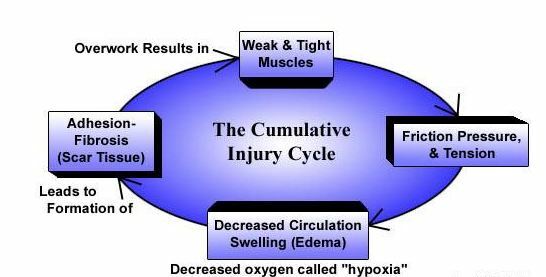 This becomes a vicious cycle that over time results in weaker and more tensed muscles and soft tissue and the cycle keeps on churning until the body turns on the alarm system that something is wrong. That alarm system comes in the form of pain! overstretched with more of the fibers torn but not complete. Symptoms may include marked pain with swelling. The area of injury is tender. Bruising may occur if small blood vessels at the site of injury are damaged as well. The movement may be difficult because of pain. strains and sprains if your sport or activity is strenuous in nature.